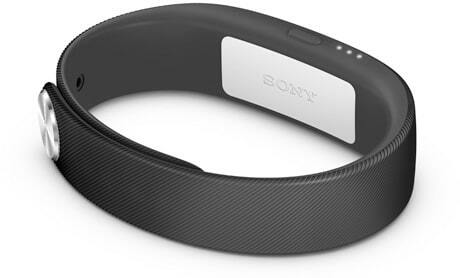 The Sony SWR10 SmartBand is a waterproof wristband that is designed to be worn 24/7 and pairs with the user’s smartphone via NFC or Bluetooth. “When a call, message or other notification comes in, the SmartBand will vibrate gently on your wrist to let you know,” Sony says. “It also has LED indicators that light up to show that the SmartBand is active. When you’re enjoying your music on the move you can play, pause and skip tracks using your SmartBand. The device was announced at the Mobile World Congress in February 2014.